The storage loft was built over other storage closets. The closet I hid in was one of three or four in this short corridor. 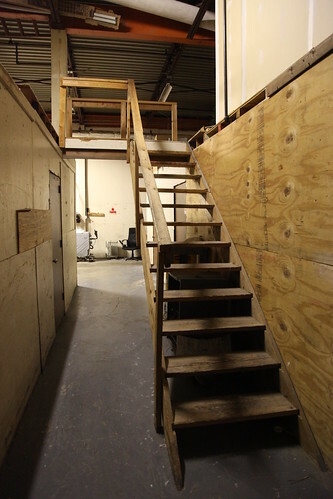 One of the storage closet's doors is seen on the left of this photo. The closet in which I hid is behind me and to the right in this shot. It was, fortunately, the only one open. I certainly would've been hard pressed to hide in the loft - perhaps still possible to remain undetected, but far more obvious as the footsteps would've been heard as I ascended. I wonder how easy it was getting the heavy metal benches up these steps.